A Beautiful blend of 95% Grolleau, 5% Cabernet Franc . Classed among the great wines of ANJOU since 1787 the vineyard is situated on the hillside of carboniferous schist. Grapes are pressed after a light fermentation to maximize the intense rose color. 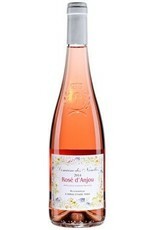 Vivid rose pink color with a round refreshing mouthfeel of fruit. Soft and light balanced by just the right amount of acidity. Finishing with a hint of strawberries. It is a medium/dry wine.